Take a card. The price is your soul. Welcome to the City of Sin, where secrets hide in every shadow. Enne Salta was raised as a proper young lady, and no lady would willingly visit New Reynes, the so-called City of Sin. But when her mother goes missing, Enne must leave her finishing school and her reputation behind to follow her mother's trail to the city where no one survives unchanged. Frightened and alone, her only lead is a name: Levi Glaisyer. Unfortunately, Levi is not the gentleman she expected: he's a street lord and con man. Levi is also only one payment away from cleaning up a rapidly unraveling investment scam, so he doesn't have time to investigate a woman leading a dangerous double life. Enne's offer of compensation, however, could be the solution to all his problems. Their search for clues leads them through glamorous casinos, cabarets and into the clutches of a ruthless society. 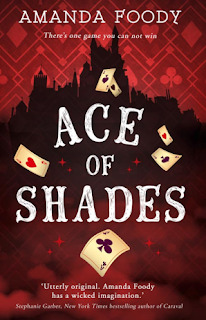 As Enne unearths an impossible secret about her family, Levi's enemies catch up to them, ensnaring him in a vicious execution game where the players always lose. To save him, Enne will need to surrender herself to the city. 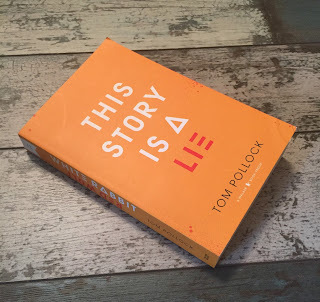 I was excited to join the blog tour for this book and it lived up to all of my expectations! Amanda Foody has created a rich fantasy world that is very reminiscent of Six of Crows. I really appreciated the City of Sin setting and the gang setup. There were lots of little details that added to the plot and the realism of the world. I also liked the relationship and rapport between Enne and Levi. Their developing connection felt very natural and I liked both of them as characters. Enne in particular went on an interesting journey through the book and I'm looking forward to seeing her in the next instalment. The plot was fun at times and tense at others! There were plenty of obstacles for Enne and Levi to face, and the book built to an exciting climax. At a couple of points I felt like the pace slowed down but otherwise I thought the plot was a real strength. This is an intriguing start to a series and I'll look forward to the next book! Thank you to HQ Young adult for including me on the blog tour and for the review copy! 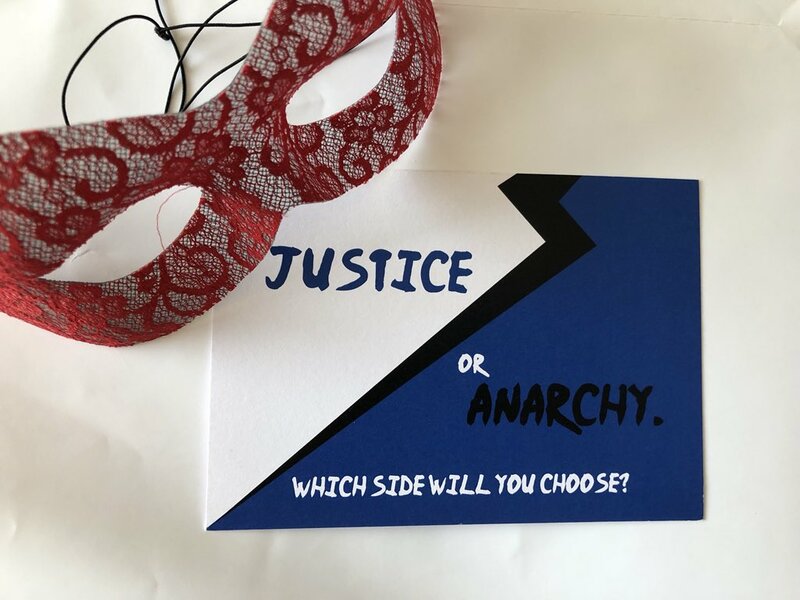 Renegades by Marissa Meyer – CHOOSE YOUR SIDE! In the Battle for Gatlon City, you can pit yourself on the side of justice or anarchy. Will you join Chelley Toy from Tales of Yesterday, who would have you fight with the Renegades who control this city? Or will you join my rebellion alongside the Anarchists? Chelley Toy wants you to... Choose the Renegades! Join The Renegades! We emerged from the ruins of a crumbled society and established peace and order in a world full of chaos. Twenty years of chaos created by Ace Anarchy and the Anarchists, The Age Of Anarchy. A time of no rules, no law and no repercussions. No police, no prison, looting and starvation. Some called Ace a visionary, but we called him a villain. The Battle Of Gatlon was officially the end of the Age Of Anarchy, our Day Of Triumph. We defeated Ace Anarchy, he was dead and order was restored. We, the Renegades, represent justice, a warm and promising hope. We are courage, bright and sparkling. Do you have what it takes to be a hero? Are you bold valiant and just like Captain Chromium, Tsunami, Dread Warden, Thunderbird and Blacklight? Don your masks and capes and join us in our annual celebratory Renegades parade or compete in our annual Renegades Trials. Remember – We’re the superheroes. We’ve got this. You are in very safe hands. Chelle makes a very convincing argument. You could do what you're told, follow blindly and walk the dull and predictable path laid out by the Renegades. They call themselves heroes and brand us villains. If you look back through history, there have been many other leaders who have disguised a dictatorship with flashy uniforms and empty promises. What evidence is there that the Renegades are as virtuous as they claim? What have the Renegades ever done for you? Still, we have crime, and good people are lost, while the Renegades look down from their ivory tower. With the Anarchists, you have a voice and you have a part to play. No ability is too small and no individual is unheard or forgotten. The only way to mend society is to break it down and rebuild from the pieces. Why not be there alongside the Anarchists to create a new world, instead of letting the Renegades fight your battles for you? Thank you so much to Macmillan Children's Books for asking us to write this post based on the wonderful Renegades by Marissa Meyer. Renegades is gripping story of superheroes like no YA I've read before, and you can check out my review here. Thank you to Chelley Toy for getting involved and for letting me use the gorgeous mask photo! Every fangirl's daydream is about to become Milly's nightmare. When Milly arrives home to discover that her mum has been taken over by something very evil, she finds herself in mortal danger. But the last people she expects to rescue her are the boys in the hottest band on the planet! As soon as I heard about this book, I knew I'd love it. A demon-slaying boy band is such a fresh idea and the book delivered on its promise of being fun and action-packed. It was the plot that had me racing to the end. I enjoyed the scenes where the boys performed just as much as the exhilarating fight scenes. There's a really good balance of light and dark moments in this book and the action builds to a gripping climax. One thing I didn't expect was that the book would explore some of the physical and emotional effects of the characters' violent lifestyle. There were characters with disabilities and those who were struggling on an emotional level. I thought this was handled sensitively and was a positive move for YA, particularly with fantastical story lines. I warmed to all of the characters in this book, especially the boys' manager Gail. The band members were all distinguishable as characters and I liked JD in particular. Milly was a believable, sympathetic main character and I was very glad that she got to fight alongside the boys. One thing that would make this world complete would be if they came across a demon-slaying girl band! This book gave me definite Buffy vibes and I'm thrilled that it was just as good as I hoped. I received this book from the publisher in exchange for an open and honest review. Thank you Usborne Children's books for sending this copy to me! 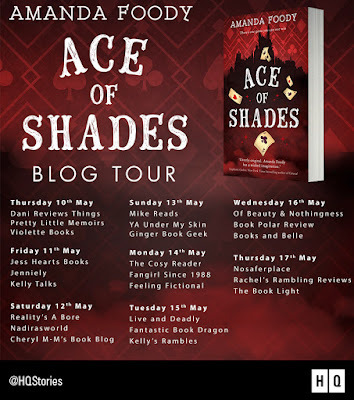 I'm so excited to have a guest post from Sue Wallman. 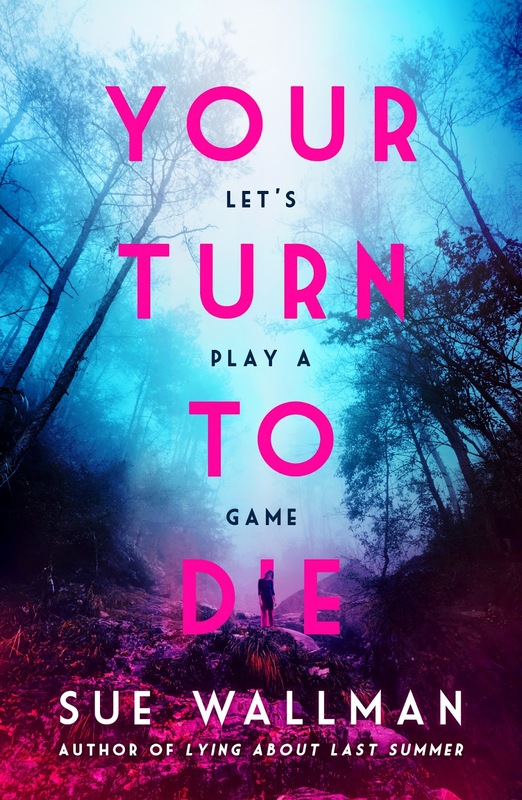 Sue has written some of my favourite YA thrillers and it's great to share what inspired the spooky setting of Your Turn to Die. You can read my review of this wonderful book here. Most of the action in Your Turn to Die takes place in Roeshot House. It’s based very loosely on my grandparents’ house. There was no attic, it didn’t have woods at the back of the house and as far as I know there was nothing disturbing buried in the garden, but there were two sets of stairs, a walk-in larder and a conservatory with knobbly geraniums in it. There was nothing remotely modern about the house. Everything was worn and faded and smelled of apples (stored on trays in the cellar) or linen that needed airing. My siblings and cousins felt completely at home there. We played card games, and lay about. We played the game the characters do in the book where you go round a room without touching the floor, climbing over the furniture. We thought nothing of crawling over the top of the grand piano. There were no rules in my grandparents’ house other than having good manners when we ate at the big dining room table. When my granny got dementia, she would sit at the table and swear and say the most outrageous things, and we would have to carry on as if this was entirely normal. In Your Turn to Die, the garden was once lovely but is now overgrown. My grandparents’ garden was large and ordered, with a huge vegetable garden behind a hedge. We ate the soft fruit, and the occasional raw bean. There was a field next to the house and I was once chased by a cow when I decided to take a shortcut back. It remains one of the most frightening things that has ever happened to me, and I’m still annoyed how everyone laughed when I came into the house, breathless, and told them. I wrote my first book in that house, aged ten, kneeling on the floor, my paper propped up on the wide window ledge in the bedroom I shared with my sister. It is 94 pages of A4 and I still have it. At night, the house was creaky and creepy. When it was dark, I never liked going upstairs on my own. The bedrooms felt very far away from the adults when we went to bed before them. My sister and I would lie in the freezing beds and speculate about what sort of people we would be when we were grown up. My grandmother died when I was at university. By then my grandfather had been dead a while. I came back for the funeral and the house felt too big and too empty. My aunt still lives in the same village so I’ve passed it often since. It’s like being able to glimpse the past but not touch it. A few years ago, my sister and a couple of cousins knocked on the door and got to see round the house again – unsurprisingly, everything had changed inside. I’m glad I wasn’t there. Thanks so much, Sue – this was a fascinating insight! I'm a huge fan of books set in spooky old houses and Your Turn to Die has particularly evocative descriptions. 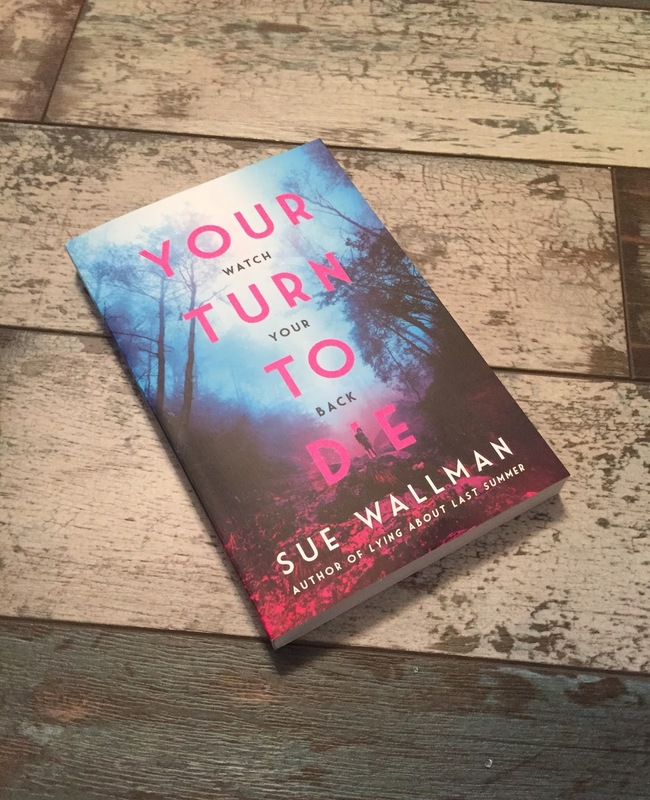 Your Turn to Die by Sue Wallman was published by Scholastic UK on 3rd May 2018. Sue Wallman lives in London, working in a school library by day and writing by night. She has previously published LYING ABOUT LAST SUMMER, a Zoella Book Club favourite title, and SEE HOW THEY LIE, a Tesco Book of the Month. Every winter, three families gather in an old house in the country to celebrate the New Year. This year, 15-year-old Leah and the other two teens discover that the house has a dark past: a deathbed confession led the police to the buried body of a teenage girl earlier in the year, who had gone missing 50 years before. As the teens investigate the morbid history, terrible things start happening around the house. And if Leah isn't careful, this New Year might be her last. I’m a huge fan of Sue Wallman’s writing and this was another fantastic YA thriller. The setting is really evocative in this book. Much of the action takes place in the enormous house where the main characters spend every new year, and I enjoyed the pervasive creepiness of the setting and the stories surrounding it. All of this adds to the overall sense of unease that hangs over the characters. One of the reasons why I love Sue’s writing is the voice. The narrative style is compulsively readable and the dialogue rings true whether the characters are teens or not. Sue Wallman's books are among my favourite YA thrillers and I can't wait to see what she comes up with next! Tomorrow, I have a brilliant guest post from Sue about her inspiration behind the book's setting. I received this book from the publisher in exchange for an open and honest review. Thank you so much to Scholastic for sending this copy to me! This is one of the most unique books I’ve ever read and I’m still thinking about it! I thought the voice of this book was absolutely brilliant. The writing style is very distinctive and every plot point was filtered through Pete’s viewpoint, as well as being shaped by his overwhelming fear and anxiety. It was also great to see mental health being dealt with in such a thrilling, action-packed book. The plot of this book was very intriguing and ultimately gripping and tense. I found the shifting timeline a little hard to navigate at first but it became a fantastic device for slowly revealing information. It’s not often that a plot takes me in completely unexpected directions and I loved how this book kept me guessing! I’m really excited about this book and I'd recommend it to all fans of thrilling YA.